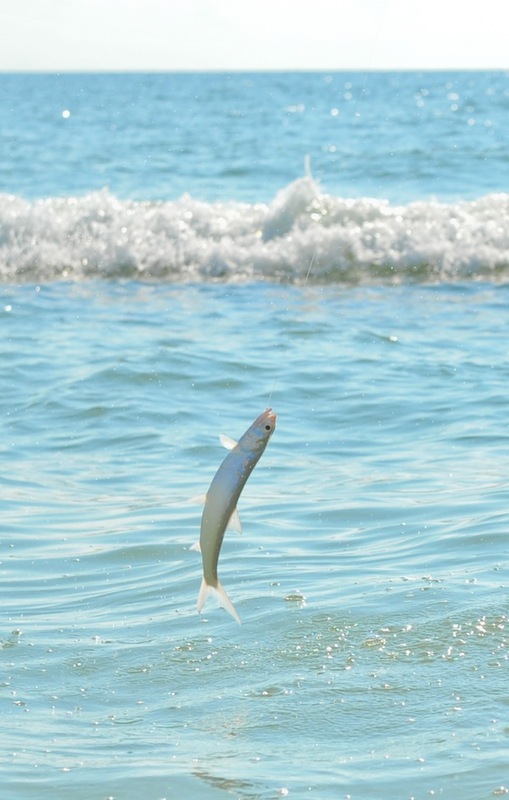 A ladyfish goes airborne after grabbing a fly off the coast of Sanibel Island, Florida. Photo by Heidi Oberstadt. The beast came to hand—all 28 inches of it, bright and silver and big-eyed and gorgeous. No. Don’t rename them. Save them all for me. Ladyfish. Pound for pound, they might be the most acrobatic inshore fish in warmer climes. They take to the air without much encouragement, performing tarpon-esque cartwheels and bonefish-esque line-peels. And they pull–hard–for a fish that, in many cases, isn’t much bigger than your average Henry’s Fork rainbow. Not that “ladyfish” is exactly inappropriate. It’s just… well… so… feminine. They’re long and sleek and slender. They have big, beautiful eyes. 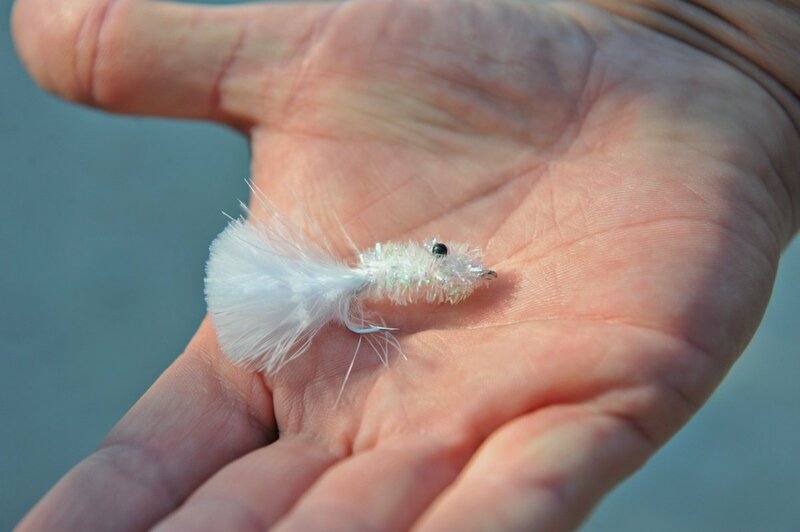 They’re flashy and sometimes hard to hook with fly. And when you finally convince them to eat, they resist valiantly. I caught my first lady fish in an inshore canal on Long Island in The Bahamas a couple years ago. It was a rainy, windy March day, making the pursuit of bonefish on the flats a real challenge. I took to blind casting into deeper waters, and the first fish to nail my Clouser was a sleek ladyfish that erupted from the dark water and danced violently across the surface. That feisty fish, a host of baby tarpon and a burly mangrove snapper saved my trip to the tropics that year, and since then, I’ve come to value ladyfish, much the way a die-hard trout angler might occasionally like to see a mountain whitefish on the end of the leader when the browns and rainbows refuse to cooperate. But, to be fair to the ladyfish, they’re a whole lot more fun than whitefish, and whole lot better-looking. On a recent trip to southwest Florida and then to the upper Keys in search of redfish and snook, ladyfish once again helped me overcome a host of conditions beyond my control, and they accounted for the bulk of my catch. I wasn’t the least bit disappointed. Norm Zeigler’s famous Schminnow. Photo by Heidi Oberstadt. Tainted waters in San Carlos Bay—thanks to discharges of polluted water from Lake Okeechobee–worked their way around the eastern tip of Sanibel Island, turning the normally emerald-clear waters into a chalky green. This made the intended target–snook moving along the breakers–impossible to see. On the bay side of Sanibel, the normally green waters of Tarpon Bay inside the Ding Darling National Wildlife Refuge were stained and burgeoning with rotting sea grass, killed off by the freshwater influx. While I was able to cast to a handful of disinterested black drum, the redfish along the flats were nowhere to be found. Off of Islamorada during the first “cold front” of the season, the normally clear waters of Florida Bay were turned up and chalky—not a redfish or snook to be seen. But in all three locales, ladyfish came calling. Casting from a sand spit on the rush of an incoming tide in Tarpon Bay, lady fish zealously outdueled spotted sea trout and Spanish mackerel for the red-and-black Clouser recommended to me by local fly fishing legend Norm Zeigler. From the beach, with a light breeze in my face, ladyfish outmuscled small jacks, trout and mackerel for Norm’s famous Schminnow, a simple fly that Sanibel’s snook can’t resist under the right conditions. From Sid Bryant’s skiff, big ladyfish pushing 30 inches crushed baitfish patterns when nothing else seemed interested. And as these vibrant denizens dance and leaped and cartwheeled over the breakers, I began to develop an affinity for these fine gamefish and I wondered why they weren’t more appreciated by fly rodders the world over. I think Sid nailed it. It’s in the name. But, honestly, what’s in a name? The first time I saw a ladyfish landed, I was chasing redfish in south Texas’ Lower Laguna Madre, and the guide who caught called it a skipjack. That name fits, particularly when a hard-fighting specimen goes airborne and tries with all its might to spit the hook. 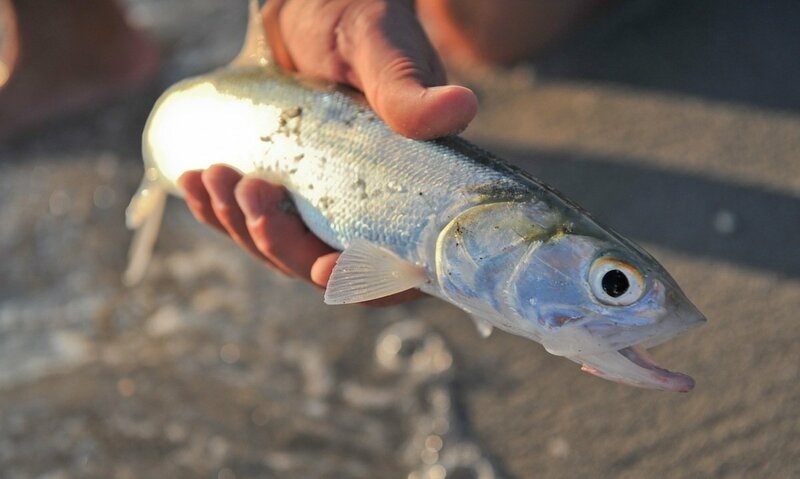 An average ladyfish caught off the beach on Sanibel Island, Florida. Photo by Heidi Oberstadt. And, despite the silvery, sleek “feminine” appearance, a ladyfish will absolutely destroy a well-tied fly. It’s mouth is a crushing machine, and a stout bite tippet–go with 30 pounds… seriously–is virtually required. I’ve seen them literally crunch lead-eyed Clousers into mush, and snap fluorocarbon leader faster than a mackerel on the run. That’s not very ladylike at all, if you think about it. But, perhaps because they’re willing and able, or maybe because they turn up when anglers are searching for other “trophies,” ladyfish have a reputation for being easy… or even trashy. And that’s not fair, either. In fact, I’d go so far as to say ladyfish are worthy targets all on their own, and, perish the thought, worth a trip to the salt just to cast into likely lies and hopefully hook into a fish that will stretch light fly tackle to its limits. Just off the beaches of Sanibel and Captiva islands in southwest Florida, ladyfish chase baitfish right up to the water’s edge. While staying at ‘Tween Waters Inn (Crab Races every Tuesday!) on lower Captiva Island in October, I hooked lightning-fast ladies within a five-minute walk of my hotel balcony. On upper Sanibel Island, while walking Bowman’s Beach, ladyfish crushed Schminnows within inches of the sand and then retreated into the breakers, peeling line from my reel as they charged away into deeper water. 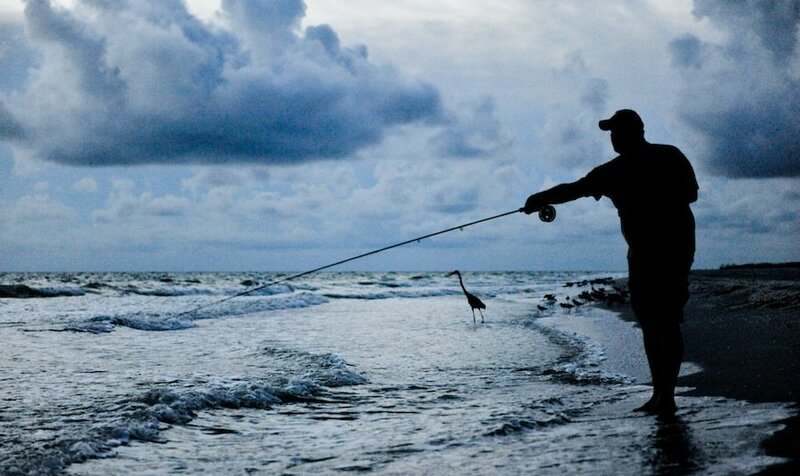 Casting at dusk to ladyfish, while the birds watch and wait. Photo by Heidi Oberstadt. While we blind-casted to them during the squall in the upper Keys, they were a bit more predictable in the surf off Sanibel. Terns and pelicans revealed pods of baitfish right up against the beach, and the ladyfish, along with a few small jacks, trout and mackerel, were stirring up the schools and hitting flies with regularity. Flies stripped quickly at an angle to the beach were chased almost as soon as they hit the water, and the strikes usually came within 10 feet of the sand. A strip-strike later, and the fish were airborne, dancing among the froth and cart-wheeling their way to deeper water, pulling line with them. Ladyfish? No, don’t change the name. I like being the only fly fisher on the beach with a blurry fly reel and a line tight to a fish that most folks disregard. I won’t let the name fool me.